Previous articles discussed the potential benefits of Colorado medical marijuana patients growing their own cannabis to use for medicinal purposes. The amount of marijuana a MMJ patient can grow for their own medicinal use varies by state. In Colorado patients can grow up to 6 plants. Hence, by growing your own marijuana, medical marijuana patients in Colorado can save a good deal of money on meds. Not to mention, growing weed for your own medicinal use can be a rewarding hobby or pastime. To grow good medical marijuana you need the all the right growing supplies and equipment. These days most marijuana grown in Colorado is grown indoors using hydroponic grow systems. Where to get a complete hydro setups in Colorado? Complete hydroponic setups can carry a high price tag, however, overtime this cost is often offset by the savings achieved from growing your own weed as opposed to buying medical marijuana from a caregiver or pot dispensary. Those growing medical marijuana in Colorado have a number of options when it comes to where to buy hydroponic grow equipment. One option for Colorado MMJ patients setting up a grow room or operation is to buy hydroponic equipment and other growing supplies from one of the many hydroponic grow shops in Colorado. Most Colorado grow shops sell everything you'll need to get growing with a good hydroponic setup. If you're planning on buying your growing equipment from a local store you may find this map of Denver Hydroponic Grow Stores useful. Another option for Colorado caregivers or MMJ patients is to buy hydroponic growing equipment or other growing supplies online. Like other categories of e-commerce, consumers buying hydroponic growing equipment or other growing supplies online can often find great deals and discounts, but must also be cautious of illegitimate online grow shops and buying faulty equipment from online classifieds or auction websites. The cost of shipping the fragile equipment used to grow medical marijuana with a hydroponic grow setup is another factor to take into consideration. Still it can be worth while shopping around on the internet for the best deals on good hydro equipment or other supplies for growing marijuana for medicinal purposes. Still another option for the do it yourself type is to take a a trip to Home Depot or your local hardware store. There you'll be able to get just about everything needed to put a good hydroponic grow setup together on your own. A few key components will still need to be purchased from another source, such as the lights, but most of what you need to get going can be bought from a local hardware store. 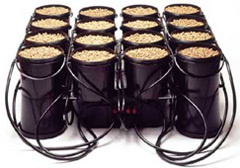 A search on how to set up bubble bucket hydroponics, top drip feed hydroponics, or ebb and flow hydroponics grow systems should get you on the right track.